Tim Walz finished filling out his cabinet with several new faces. Photo courtesy of Briana Bierschbach. Since being elected to public office, Gov. Tim Walz has wasted no time in filling out his cabinet. The governor evaluated more than 500 applicants with help from Lt. Gov. Penny Flannagan, who led the transition team during their search. 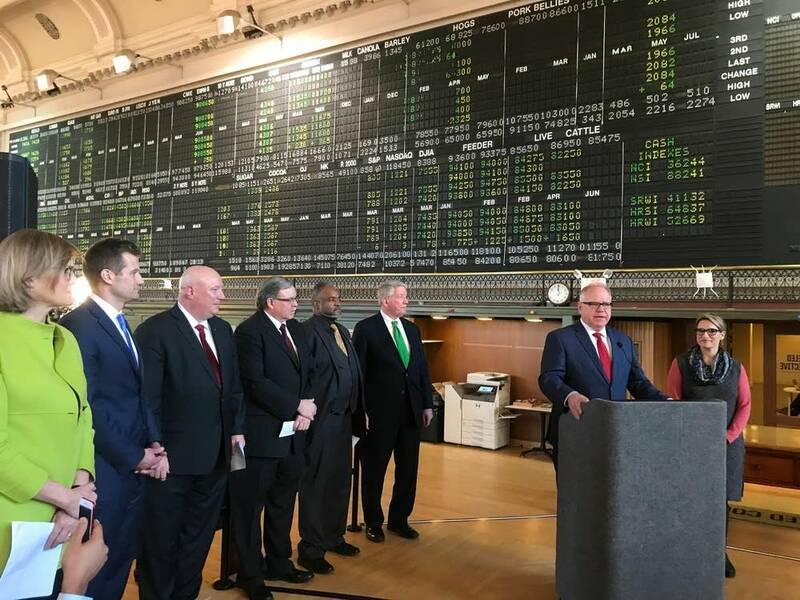 After reviewing the candidates for several weeks, Walz finalized his picks on Friday, Jan. 4 when he unveiled the department heads during a speech at the Minneapolis Grain Exchange. Although he is succeeding a fellow Democrat in Gov. Dayton, Walz chose to reshape Minnesota’s administration by nominating mostly new faces from a variety of backgrounds. Of the 22 cabinet members, only Cynthia Bauerly of the Department of Revenue and Myron Frans of the Department of Management and Budget were retained from the Dayton administration. Many of the picks come from the private sector, nonprofit organizations, and labor unions. Although they all have lengthy experience in their fields, most of the members have little experience in government, leading some Minnesotans to feel weary towards the notion of them having responsibility over large, complex institutes with billions of dollars in budget. Despite the concern, Flanagan is optimistic of this administration’s ability and potential. She especially praised the diversity of the cabinet, which is comprised of over 50 percent females and 20 percent people of color. Walz’s concern towards the state of our current political system is not just warranted—it also corresponds with a growing anxiety shared by many citizens. When the prominent research firm Gallup conducted a nation-wide survey in late December, 20 percent of respondents claimed that the biggest problem in America was government leadership. This is a fear which has only been amplified given the ongoing trade war and recently ended government shutdown. In light of these events, it is expected that Minnesotans will anticipate strong leadership from the Walz administration, especially given the fact that the governor emphasized his commitment to promote political unity. Despite this promise however, there is no guarantee that Walz will have more control over Minnesota politics compared to his predecessor. Minnesota may have experienced a blue wave in the 2018 midterm election, but its state legislative bodies are still evenly split. The State Senate is composed of 49 percent Democrats and 51 percent Republicans, while the House of Representatives maintains an even split between the two parties. This division will challenge Walz, but he will still be able to confront some of Minnesota’s most pressing issues with two key cabinet picks. One important appointment is Larry Herke, who will lead the Department of Veterans Affairs. Herke is a retired colonel who served 31 years in the U.S. Army and Minnesota National Guard, and will be responsible for managing outreach treatment and benefits for its retired soldiers. As a veteran, Herke shares a close bond with this community. Walz is a veteran himself and served on Minnesota’s Committee on Veteran’s Affairs for a number of years. He stated that veteran’s affairs would be one of his top priorities, which matters all the more for a state that has fumbled its outreach programs on numerous occasions. The state needs Herke to confront some of the department’s many faults. Another essential pick is Thom Peterson, who will head the Department of Agriculture. Petersen is a former lobbyist for the Minnesota Farmers Union, which means he has preexisting ties with both farmers and legislators. Minnesota’s farmers are currently struggling with both a trade war and a lack of demand for traditional commodities. Petersen will be responsible for deterring a rapid rise of bankruptcies, and to help make Minnesota a strong trade partner again. Through this new cabinet, the Walz administration is confident that they will be able to improve conditions for its citizens, and the state overall.